To celebrate the 2018 Hugo Awards, Bookmarked reviews the novella and novel categories in this second finalist preview post. With the aid of a local monastery, the oppressive Protector Sonami succeeds in quashing riots amongst her subjects. In return, she promises to present one of her own children to the monastery’s Head Abbot, Sung. When Sung comes to collect the child, he is shocked to find that Sonami is actually giving him not a single older child, as he had imagined, but two newborn twins. The years pass and the two twins, Mokoya and Akeha, take their places in the monastery, where they learn to work with the psychic force known as the Slack. On top of this, Mokoya begins showing a gift for prophecy at the age of nine. News of this development reaches Sonami, who decides to take her newly-prophetic child back into her home; the twins hear of this plot and, fearing their imminent separation, run away from the monastery. The Black Tides of Heaven takes place in a society where children are treated as gender-neutral at birth, and typically choose to identify themselves as either male or female at some point in their lives—a process known as confirmation, which happens at different ages depending on the child. As six-year-olds, Mokoya and Akeha vow never to undergo confirmation. But by the age of seventeen, Mokoya has changed their mind and decides to identify as female. Meanwhile, Akeha still hopes to stay non-binary; only after witnessing Mokoya’s confirmation do they decide to become male. This divergence in gender symbolises a wider split in the relationship between the twins. Mokoya stays behind and acts as an officially-ordained prophet, while Akeha drifts away and eventually falls in with the Machinists, a revolutionary movement. The Machinists aim to make use of cutting-edge technology, such as firearms and explosives, which can be placed into the hands of the masses so that the Protectorate’s magicians no longer have the monopoly on deadly force. 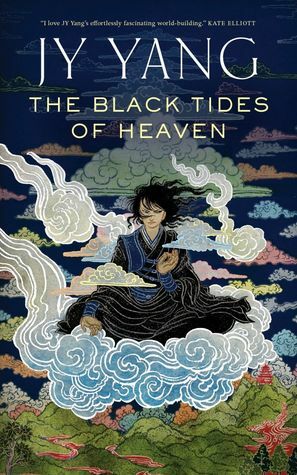 The plot of The Black Tides of Heaven is based on the theme of fate versus free will, which Yang plays with and analyses from different angles, delighting in ironies and contradictions. The story depicts a land where personal freedom extends to each citizen’s right to choose their own gender, but which is nonetheless ruled by an oppressive tyrant. Mokoya’s prophecies indicate that the future is predestined, and yet the characters cling to every hope that they can alter their fates and look for loopholes in the predictions. The central relationship between the twins is sometimes dictated by the fate of family ties, other times thrown out of order by chance happenings. 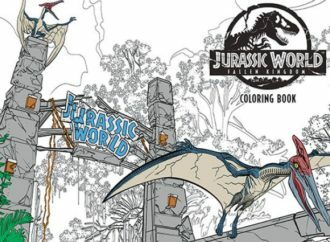 All of this takes place atop a solid base of world-building. Yang regularly skips the narrative forward by years at a time, and yet this never disrupts the story. The characters and their political backdrop are so consistent and believable that the plot remains firmly anchored. 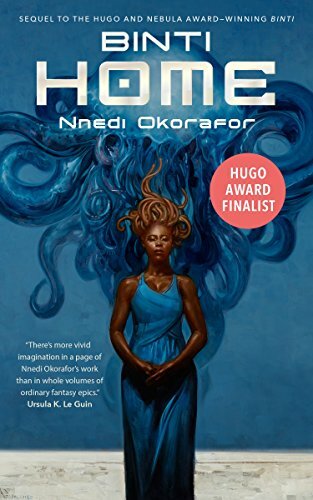 This sequel to Nnedi Okorafor’s previous Hugo-winner continues the story of Binti, a Himba girl who travelled from Earth to study at the extraterrestrial Oomza Uni. Here, various alien races rub shoulders (or equivalent body parts) including the Meduse, a race of jellyfish-like aliens hostile to the dominant cultural group of Earth, the Khoush. Binti is changed after the events of the previous novella. 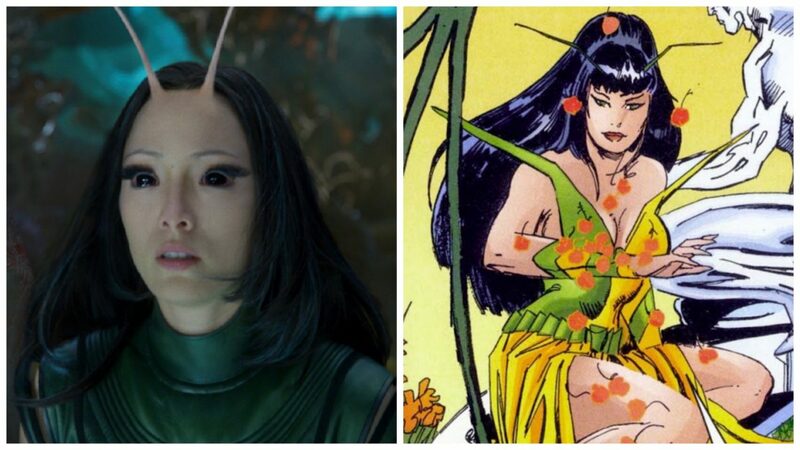 Some of the changes are physical, particularly the fact that genetic interference has left her a human/Meduse hybrid, her hair replaced with a set of tentacles. Others are psychological: having witnessed the death of her entire class she must now cope with post-traumatic stress disorder and flashbacks to the massacre. In Binti: Home, our heroine embarks on another journey, this time back to Earth. She is accompanied by Okwu, a Meduse acquaintance she made in the previous book. Okwu hopes to act as an ambassador for its people and help bring about peace, while Binti intends to visit her relatives. The second book in a trilogy, Binti: Home suffers from the narrative sag that tends to accompany middle volumes, being less satisfying than the first instalment and introducing a number of loose ends to be tied off in the third. Nonetheless, as Binti’s universe continues to grow and develop, the story becomes increasingly enticing; Okorafor’s skill at conjuring up glittering imagery certainly helps. A worthy successor to the first book and a promising lead-in to the final installment, Binti: Home seems a likely Best Novella contender this year. In this prequel to last year’s Best Novella finalist Every Heart a Doorway, Seanan McGuire divides this story behind two of that book’s side characters: Jack and Jill. The story begins with twins Jacqueline and Jillian Wolcott being born to their overbearing and reluctant parents, who do their best to ensure that the twins follow a strict path through life. Growing up, Jack and Jill—or Jacqueline and Jillian, as their parents insist, having no love for nicknames—are identical, but at the age of four the Wolcotts decide that the two girls need to be given distinctive appearances. Jill, being more active, ends up with jeans and short hair, while the comparatively sedate Jack is granted a lavish dress. Where Every Heart a Doorway was a meditation upon different types of portal fantasy, Down Among the Sticks and Bones takes a different tack by offering a straightforward portal fantasy of its own. The twelve-year-old twins are transported to a world of Gothic horror, filled with lycanthropes and the undead, where they go their separate ways. Jack finds work as an apprentice to a mad scientist named Dr. Bleak, while Jill ends up in the dubious care of a vampire known simply as the Master. 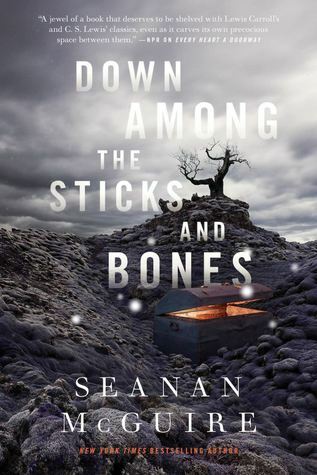 Down Among the Sticks and Bones is an oddly-pitched novella, written in the idiom of a children’s story and yet—as an early reference to condoms makes clear—not written for children at all. The twins do not enter the fantasy world until around a quarter of the way through the narrative; up until that point, the novella is in large part an extended rumination on childhood gender roles, making observations on such matters as how twin girls are seen as more uncanny than twin boys (“blame John Wyndham and Stephen King and Ira Levin”) and how girls seen as tomboys tend to grow into girls seen as nerds. Once the twins head down the staircase, the novella becomes something rather different. The broadly-drawn mundane world (reminiscent of Harry Potter’s life with the Dursleys, or various Roald Dahl books) is replaced with a fantasy land that draws equally upon fairy tales and 1930s Universal horror films. The analysis of gender segues into an analysis of social class, Jill’s opulent but soulless life as a vampire’s heir contrasting with Jack’s earthy existence as a mad scientist’s assistant. Occurring alongside all of this is a coming-of-age story. The twins age from twelve to seventeen during their time in the Gothic otherworld, and must deal with such matters as periods (dangerous things in this land, as blood attracts vampires) along with sexual awakenings. Jack falls in love with Alexis, a dead girl resurrected by Dr. Bleak, while Jill pursues her ambiguous relationship with the Master. Down Among the Sticks and Bones feels as though it is less than the sum of its parts. It has a good helping of interesting ideas, but they never quite come together. The result is not entirely coherent: one part children’s story, one part exercise in adolescent angst, both a self-contained narrative, and an extension of Every Heart a Doorway. 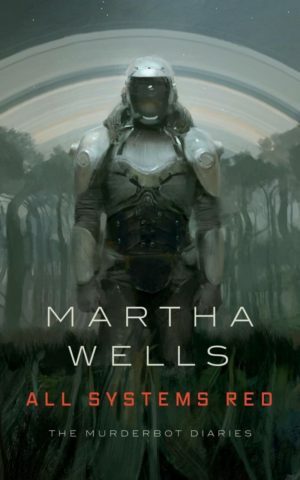 The main character in this novella is a cyborg “murderbot” who works for the highest bidder. Its latest client is a group called PreservationAux, which has an eye on the resources of an unsurveyed planet and needs a bodyguard to accompany an expedition there. As it probes the world, the PreservationAux team finds that information on hostile wildlife in the area has been removed from its data banks, in what may be an act of deliberate sabotage. The team then loses contact with another group on the planet, DeltFarr, and so decides to head to their settlement and investigate. It turns out that the DeltFarr team was killed by its own security bots, another case of apparent sabotage. Can they trust their cyborg bodyguard—who, as it turns out, has a history of malfunction that justifies the name “murderbot”? All Systems Red is in part an adventurous romp through a dangerous hi-tech world. It works on this level, offering an engaging set-up where technology is unfamiliar to the reader and untrustworthy to the characters, leading to plenty of tension and intrigue as the plot develops. On another level, meanwhile, it is an exercise in humanising its central character, the deadly cyborg. The murderbot acts as a first-person narrator, revealing a sympathetic outlook and a memorable list of personal idiosyncrasies. For one, this deadly cyborg is fond of streaming television, and uses popular fictions as reference points throughout the story in a narrative choice reminiscent of a Best Short Story finalist, Vina Jie-Min Prasad’s “Fandom for Robots.” Also prominent is how the murderbot strives to avoid intimidating the human members of the expedition, initially by trying to come across as a benign robotic tool. It is the cyborg’s attempt to fit in with humans and leave behind a shady past that becomes the main thrust of the narrative by the time the novella is over. River of Teeth takes place in the Louisiana of an alternate nineteenth century, where hippopotami have been introduced to the American bayous (in reality, this idea was seriously mooted by Congress at one point as a possible means of dealing with invasive water hyacinth while also providing a new food supply from hippo meat). This has given rise to a community analogous to the cowboy culture of the West, with hippos serving as both steeds and livestock to the swampland ranchers. But not all of the hippos are domesticated. Louisiana is also home to a population of feral hippopotami, which pose deadly threats to anyone who gets too close. The Mississippi in particular has something of a feral hippo problem, and the government seeks to clear them out so as to secure a trade route. To this end, the authorities recruit a Magnificent Seven-esque team to tackle the troublesome beasts: Winslow Houndstooth, a grizzled hippo-rancher from Blackpool; Regina “Archie” Archambault, an extravagant French wheeler-dealer; Hero Shackleby, a retired adventurer who only reluctantly joins the mission; Cal Hotchkiss, a rancher with a shady past; and Adelia Reyes, an assassin. Despite being set in an alternate nineteenth-century society, in terms of both the hippo scenario and the permissive attitude towards gender nonconformity (Hero is non-binary, something that is accepted without question by the other characters), River of Teeth is not particularly concerned with exploring the deeper implications of its parallel history. Its setting exists mainly to provide an exotic backdrop to what is, in many respects, a traditional Western story. Nonetheless, River of Teeth is a very good western. 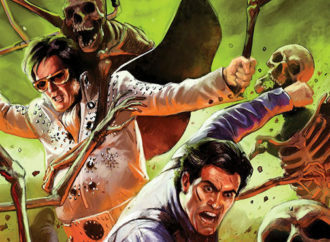 Its narrative is an engaging pulp adventure which maintains a sense of humour without falling into parody, and backs up its action-oriented narrative with well-crafted plotting. Hero, Winslow, and company are pitted against not only the deadly hippos and the scheming Travers, but also each other’s histories. The five protagonists all have skeletons in their closets and are never sure exactly which of their team members to trust. The story is thus structured around betrayals and revelations as much as the hippo-battling adventure across the Mississippi. 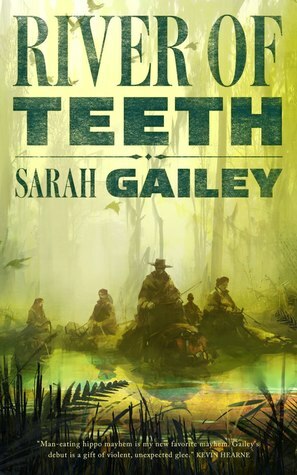 In the world of speculative fiction, there is always room for an unabashed escapist romp, and River of Teeth more than delivers on this count. Sarah Pinsker casts herself as the protagonist of this story, in which her fictional counterpart is invited to “an alternative-reality resort hotel lobby swarming with Sarah Pinskers.” More than two hundred, in fact. 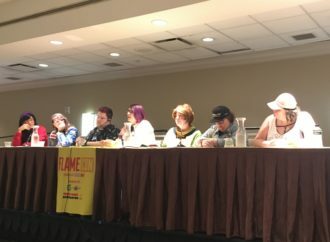 It turns out that one of these Sarah Pinskers discovered a means of creating a portal between universes, thereby allowing her multiversal selves to congregate at SarahCon. Discussion at the convention ranges from casual banter about minor differences between the various Sarahs, to serious-minded panel talks on how different Earths can learn from one another. But then things go horribly wrong: one of the Sarah Pinskers turns up dead. In true murder mystery fashion, harsh weather prevents the police from arriving from the mainland. As an insurance investigator, the protagonist is the closest thing to a detective at the convention, and so it falls upon her to solve the murder. The odds are pretty good that the killer is Sarah Pinsker—but which one, and why? “And Then There Were (N-One)” is a story of three distinct phases. 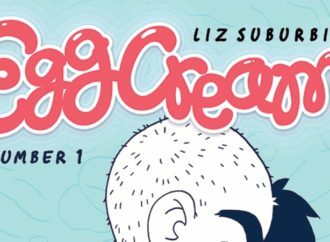 The first of these is centred on the quirkiness arising from a convention filled entirely with authorial self-inserts, all comparing and contrasting their parallel lives. For much of its early stretches, the story seems as though it will be a one-note exploration of a whimsical premise. Then comes the second phase, where the murder mystery comes into play. The oddball setting plays host to a narrative lifted from Agatha Christie, allowing the story to explore darker themes arising from its premise. For the protagonist, the enjoyable buzz of meeting various alternative selves segues into the uncanny sensation of handling what is, in terms of outward appearance, her own corpse. (Although broad humour still has a part to play: the murder weapon turns out to be the Nebula Award that the real-life Sarah Pinsker won for “Our Lady of the Open Road,” which is one of the various items on display in the convention). The third and final phase comes with the unmasking of the culprit. As with any good murder mystery, the killer’s motives stem naturally from the plot and themes of the story without being readily predictable. A decidedly offbeat contribution to the field of murder mysteries, but a most welcome one nonetheless. The world of the mid-twenty-second century has been ravaged by global warming. New York, now flooded, has converted itself into a Venice-like city of water. 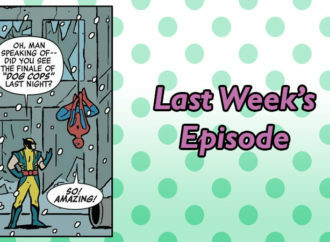 Two Manhattan coders, Mutt and Jeff, get into a discussion about how the world ended up in such a mess … and then they go missing. Inspector Gen of the NYPD ends up with the job of investigating the disappearance of the two men. One by one, various citizens from all walks of New York life get embroiled in the mystery: Vlade, superintendent of the building where Mutt and Jeff worked; Franklin, a day trader who treats the financial scene as something of a game; Amelia, a globe-trotting TV presenter; and Stefan and Roberto, a pair of homeless teenagers. Together, each drawing upon their personal outlook, these people begin to unravel a conspiracy that has separated the haves from the have-nots for too long. While New York 2140 is set against a backdrop of anthropogenic global warming, the issues it tackles are largely economic rather than ecological, with the novel’s environmental devastation treated ultimately as the collateral damage of human greed and shortsightedness. Robinson shows an ambivalent attitude towards environmentalism, as evidenced by the subplot involving a plan to save polar bears by transporting them to the South Pole. This scheme provokes the ire of a group called the Antarctic Defense League, which sees it as no more than further meddling in the natural world. Turning eco-terrorist, the group resorts to killing the animals that it should by all rights be helping to conserve. 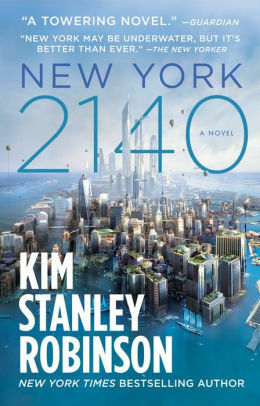 To survive the future, New York 2140 argues, people will have to get used to big changes. So the people of the 2060s staggered on through the great depression that followed the First Pulse, and of course there was a crowd in that generation, a certain particular one percent of the population, that just by chance rode things out rather well, and considered that it was really an act of creative destruction, as was everything bad that didn’t touch them, and all people needed to do to deal with it was to buckle down in their traces and accept the idea of austerity, meaning more poverty for the poor, and accept a police state with lots of free speech and freaky lifestyles velvet-gloving the iron fist, and hey presto! On we go with the show! Humans are so tough! Into this morass of bitterness and cynicism comes a plot device straight out of children’s wish-fulfillment fantasy: hidden treasure. The youngsters Stefan and Roberto embark on a search for the lost wreck of the HMS Hussar and the gold coins it harbours—and, with the aid of an elderly cartographer, they actually find it. This leads to a discussion about what to do with the treasure. Should the centuries-old coins be kept in their present form, thereby retaining historical value but introducing all manner of red tape as to ownership? Or should they be melted down into plain gold, so that the finders can be its keepers? This mirrors a wider concern in the novel about the divide between material wealth and paper money, a divide that has led to lush buildings owned by wealthy citizens going unoccupied while the homeless starve below. Robinson recognises the perils of didacticism, and balances the novel’s opinionated stretches with more conventional fare such as action scenes (characters deal with polar bears loose on an aircraft, or race to save drowning kids) and romantic subplots. All of this eventually reaches a climax of storms, riots, and collapsing conspiracy. New York 2140 is a demanding book, make no mistake, but it has plenty to offer a patient reader. Various textured characters exist within this setting. Cardenia is the daughter of the Emperox of the Holy Empire of the Interdependent States and Mercantile Guilds, King of Hub and Associated Nations, Head of the Interdependent Church, Successor to Earth and Father to All. In time, Caredenia succeeds her father as the new Emperox. Kiva Lagos is the owner of a trade ship named Yes, Sir, That’s My Baby, which transports fruits from one planet to another. The ship’s stock runs into a bit of a contamination problem, and so Kiva edges into a more profitable line of business: transporting wealthy refugees away from conflict zones. The Interdependancy is in a state of disarray with a rebellion taking place, but there is much more turmoil on the horizon: the Flow is collapsing, and within a few years it will cease to function, severing the various segments of the Interdependency. While this is occurring, the villainous Lord Ghreni Nohamapetan arrives on the scene. He needs to capture Marce from Kiva for his own purposes, so he teams up with space pirates in order to achieve this goal. As the story unfolds it turns out that Ghreni’s siblings Amit and Nadashe are also involved, and that Ghreni himself—rather than being the central villain—becomes something of a wheeler-dealer, acting as part of a larger scheme. Such power struggles in the face of impending disaster, as the assorted characters develop conflicting views of humanity’s future, are the main substance of The Collapsing Empire. The protagonists rarely mince words: the dialogue is characterised by a fondness for throwing out regal decorum and business formality in favour of profanity-laden trash-talking. This pugnacious tone extends beyond the characters and throughout the entire novel, which has a certain barroom conversation flavour about it—part enthusiastic, gesture-filled explanation, part let’s-settle-this-over-a-beer argument. This was, of course, an absurd way of looking at the Flow. The Flow is not anything close to a river—it is a multidimensional brane-like metacosmological structure that intersects with local time-space in a topographically complex manner influenced partially and chaotically but not primarily by gravity, in which the ships accessing it don’t move in any traditional sense but merely take advantage of its vectoral nature relative to local space-time, which, unbounded by out universe’s laws regarding speed, velocity, and energy, gives the appearance of faster-than-light travel to local observers. And even that was a crap way of describing it, because human languages are crap at describing things more complex than assembling a tree house. This is all very typical of John Scalzi. His fiction has its roots in the Golden Age of SF but, at the same time, it is unmistakeably now. 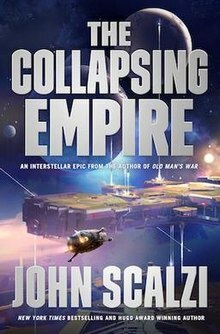 The Collapsing Empire may not be remembered as one of his most substantial outings, but it still manages to show how he picked up a following. Ann Leckie returns to the universe of Ancillary Justice, this time with a new set of characters. 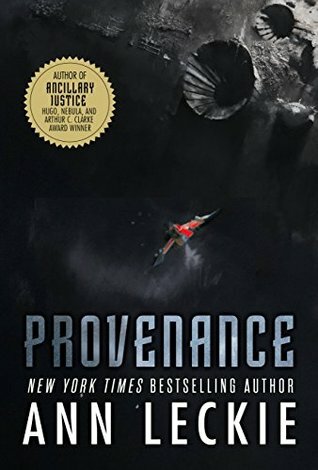 Provenance introduces readers to Ingray, an affluent woman who blows her wealth on arranging for a thief named Pahlad Budrakim to be freed from a prison planet (or Compassionate Removal, as the authorities prefer to describe it). Pahlad was incarcerated for stealing priceless artefacts that Ingray hopes to get her own hands on. This turns out to be the beginning of a string of complications for Ingray. Having gambled her fortune, she meets the subject of the jailbreak … who denies being Pahlad Budrakim. What seemed like a simple endeavour in fact drops Ingray headfirst into a world of criminal intrigue—or more accurately worlds of criminal intrigue, as all of the skulduggery blurs into interplanetary power-politics. What starts out as a McGuffin-hunt over some artefacts segues into a whodunit arising from the murder of a political leader, before the plot is consumed by a conflict between various factions. Much of this will feel familiar to fans of Leckie, as Provenance is similar to the Ancillary series in how it shows interest in the smaller-scale cultural impacts of interplanetary conflict. To highlight just one example, the Radchaai Empire committed genocide against the Garseddai in this universe. This leads to people identifying themselves as part-Garseddai because, in the words of one character, “it’s tragic and romantic to be Garseddai.” The cultural phenomenon becomes so prevalent that people express disbelief when a character makes a legitimate claim of being part-Garseddai. It should also be noted that this is a dialogue-heavy book. Even as the novel’s central conflict heats up towards the climax, most of the action is conveyed through the characters’ conversations—so much so that it is easy to imagine the novel being adapted into a stage play. Leckie fortunately handles the necessary exposition with skill. Instead of info dumps, she deploys an info snowball, one that starts out small at the novel’s beginning but expands as it rolls along, absorbing each new development in the narrative. Established followers of Leckie will be pleased with Provenance. As for newcomers, it will make for a good introduction to her style. N. K. Jemisin’s Broken Earth trilogy began with The Fifth Season and continued with The Obelisk Gate, with each of them becoming Hugo winners in the past two years. Now the series draws to a close with The Stone Sky. 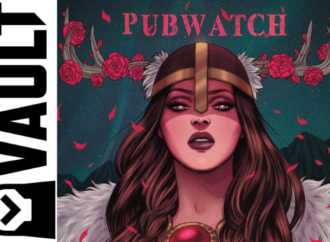 In this final trip to a post-apocalyptic world where magic and technology mingle, and those with supernatural powers are persecuted, the various narrative strands of this series finally come together. With the first two novels having used the fantasy concepts of orogenes and stone eaters to explore oppression, The Stone Sky discusses what the end to that oppression may look like. If everyone in the world were a stone eater, would that end the persecution of orogenes and stills? And if humanity’s relationship to itself is to be evened out, how should humanity’s relationship with the Earth be rethought? And so, inevitably, the protagonists of The Stone Sky end up on a mission not to save the world, but to burn it and start again. 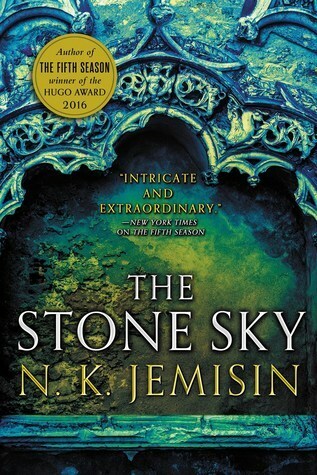 N. K. Jemisin uses The Stone Sky to bring much of her trilogy’s themes full circle. The image of Earth personified as an old man, which began the series at the start of The Fifth Season, returns—with the addition of the Moon as the Earth’s child. The Moon has since been lost, which, as per the folklore of the story’s world, angered Earth enough to trigger a post-apocalyptic state. And, as it turns out, the Moon plays an important part in the story’s conclusion. A satisfying close to a wide-ranging trilogy. In this sequel to last year’s military space opera Ninefox Gambit, the tensions between the different factions of the hexarchate remain. Kel Command is forced under short notice to deal with a Hafn invasion, as one of its generals has been assassinated by the Hafn, leading to a chaotic scramble. Into the mayhem comes Captain Kel Cheris … who is dead. As a result of the previous book’s events, Cheris has the mind of the deceased Shuos Jedao controlling her body. Jedao was, in life, a notoriously unstable military genius. Raven Strategem spends much of its time exploring the nitty-gritty of its various intrigue-laden regimes. In doing so, it comes up with a clear depiction of a dystopian society where people have simply given up hoping for better. Everyone can see that the hexarchate is corrupt; but they tell themselves that alternative regimes would be even worse. With amoral leaders, an apathetic populace, and all manner of petty bureaucrats between the two, the novel portrays a universe in sore need of a conscience. This is a role that falls upon, of all people, Jedao. It seems a tall order for an individual with such a bloody past to help shape society for the better—but then, with Jedao, not everything is as it seems. Raven Stratagem has a vivid cast of characters to surround its protagonist. Lieutenant Colonel Kel Brezan is bitter about Cheris’ success, and he later ends up in a scheme to assassinate Jedao. General Kel Khiruev, whose father was killed for treason to the hexarchate, feels like a traitor now that she is working for Jedao, who belongs to another faction. Hexarch Shuos Mikodez has maintained his position of leadership for decades, an unusual length of time as most people in his job get assassinated. The unique approach to space combat is carried over from the previous novel in the series, with the warring factions altering reality by manipulating the calendar. Those unfamiliar with Ninefox Gambit may find themselves lost during the action and intrigue; indeed, a climactic twist revelation hinges almost entirely on knowledge of Cheris’ exploits in the previous book. 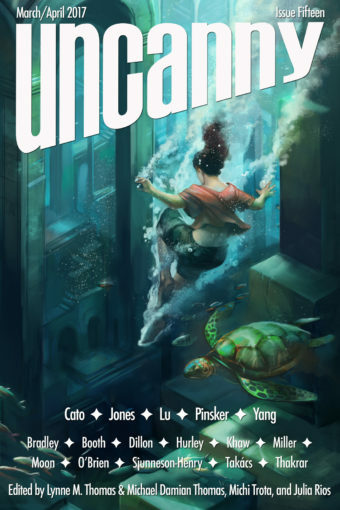 This is in contrast to Yoon Ha Lee’s Best Novelette finalist “Extracurricular Activities,” which takes place in the same universe but works as a standalone story. 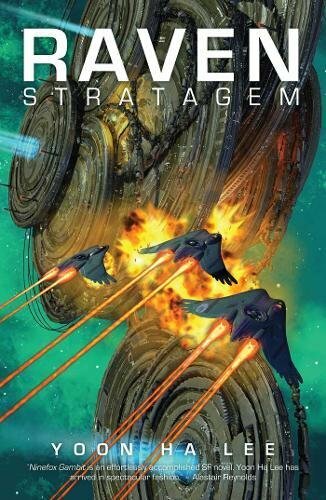 Meanwhile, readers who appreciated Ninefox Gambit will find Raven Stratagem to be a worthy sequel that expands on the series’ universe in terms of both world-building and characterisation. Humanity has achieved an immortality of sorts through cloning: if a person dies, their consciousness can be transferred to a newly-minted body, returning them both to life and to the peak of health. This development has, inevitably, brought with it a raft of moral and philosophical questions, and the world is mired in heated disputes over the rights and roles of cloned citizens. Meanwhile, drifting through space is a ship where a number of these conflicts are about to play out in microcosm. The passengers on board the ship are in stasis, leaving a six-person crew and the resident AI to take charge of things. But then the crew awake to find that they have been killed, and automatically resurrected as clones. The homicides can only have been carried out by one of the six crew members, but as the clones lack memories of the occurrence, it seems that none of them—perhaps not even the killer—knows who was responsible. In Six Wakes, Mur Lafferty plays with a range of tantalising philosophical ideas about the nature of self. One scene reveals that Katrina was not killed, contrary to assumptions, and her clone was created while her previous body was still alive. However, the law requires the previous clone to be euthanized. But would such a move be ethical? Meanwhile, another crew member turns out to have been a staunch opponent of cloning back when he had his original body. So how does he cope with having ended up as a clone himself? It would be misleading to say that such concerns are the main focus of Six Wakes. At its heart, the novel is a whodunit; its plot is driven by the mystery of who committed the murders and why. But through the depth of her worldbuilding, Lafferty has not only ensured that both the mechanics and the motivations behind the crime are engaging. She has also given the reader plenty of wider notions to ponder during the story. The six novellas are a strong set, with a noticeable emphasis on heroic adventure across different genres. Binti: Home is a space opera; All Systems Red a more nuts-and-bolts science fiction adventure; “And Then There Were (N-One)” a detective story; River of Teeth a Western; The Black Tides of Heaven a rebellion-against-the-tyrant high fantasy story; and Down Among the Sticks and Bones a Gothic a portal fantasy. Which is best will depend in large part on the genre preferences of the individual reader. Personally, I found that The Black Tides of Heaven engaged me the most. With the six novels, one of the most noticeable things is the heavy leaning towards science fiction, rather than fantasy. Even the most fantastical of the books, The Stone Sky, contains a heavy element of technofantasy and pseudoscience. Also noticeable is a preoccupation with the apocalypse: New York 2140 is about the devastation wrought by global warming; The Collapsing Empire uses what could be seen as a space opera analogue to this topic; and The Stone Sky is a post-apocalyptic story. The related theme of old regimes that need to be done away with can be found in both Provenance and Raven Stratagem. 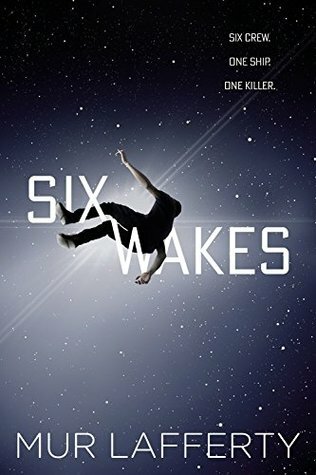 The remaining novel, Six Wakes, is a crime drama set in space, which puts it in similar genre territory to Provenance, The Collapsing Empire and, in certain respects, Raven Stratagem. In short, there are some definite linking factors between these books, even if they generally take different approaches to their themes. My pick? Well, I am torn between two quite different books: one is the densely-packed New York 2140, the other is the slicker and more streamlined Six Wakes. Kim Stanley Robinson is already established as a Hugo powerhouse, which leads me to go for the underdog vote and choose Six Wakes.